Here are the important features and factors you need to consider when choosing for the right top handle chainsaw that will suit your need and budget. 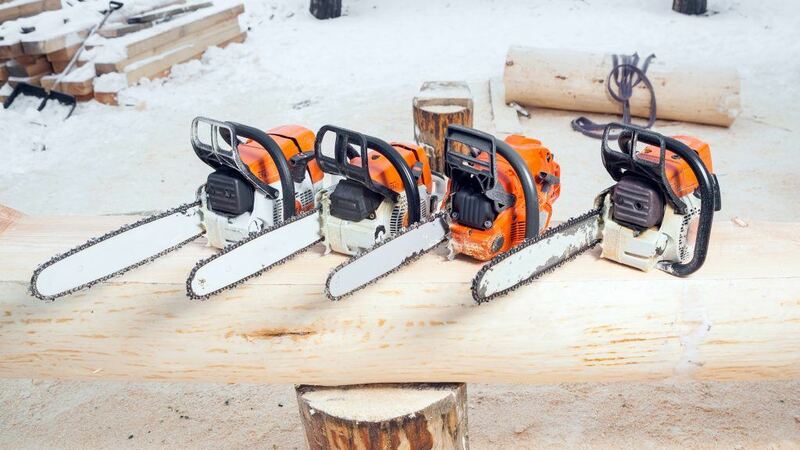 The strength of any chainsaw is dependent on the cc specs of its engine. Most chainsaw engines have 32cc rating ideal for medium to heavy works. Another parameter to measure its performance is based on its speed expressed in feet per minute (FPM) or feet per second (FPS). 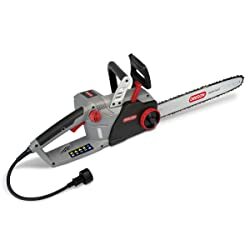 The types of top handle chainsaws are classified according to how they are powered: gas-powered, corded electric, and battery-operated or cordless types. Each type has its own pros and cons which you need to weigh depending on your needs. We have the top handle and the rear handle. For common works and beginners, mostly a rear handle chainsaw will be most suitable. Meanwhile, top handle chainsaws are commonly used for high altitude cutting works. It is suitable to choose a handle covered with soft rubber to avoid hand fatigue when working for long hours. The chainsaw or guide bar is the flat metal where the chainsaw chain rides along. A good guide bar must be corrosive-resistant, durable, and has high tensile strength so it won’t break easily when bent. Most chainsaw bars have lengths between 10” to 16”. On the other hand, there are three types of chainsaw chains: full chisel, semi-chisel, and standard chisel. Most top handle chainsaws sold in the market have the standard chisel chain. Aside from that, chains can also be classified based on how they make cuts with respect to the wood grain. If you want to make a cut parallel to the wood grain, then you need to use a ripping chain. Whereas, if the cut is across the wood grain, then a standard or regular chain will do. To avoid hand fatigue and easy maneuvering, it is better to choose a lightweight type. 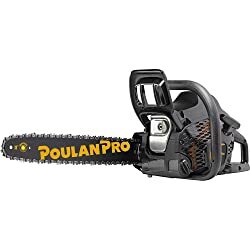 If you have stronger hands and arms, then having a slightly heavy chainsaw won’t be a problem. This feature is present in high-end chainsaw models but the main point is to lubricate your chainsaw before using so that you'll have a smoother cutting process. Chainsaw units have two safety features: chain brake and throttle back. The chain brake ensures the safety of the user by reducing the chance of getting a kickback. This mechanism is present between the chain and the front handle of the tool. Whenever a kickback happens, the chain brake pushes down the chain so that it won’t make a full kickback towards the user. Meanwhile, a throttle lock is a safety feature which prevents accidental start-ups. It can be a push button that you need to press before pulling the main trigger. 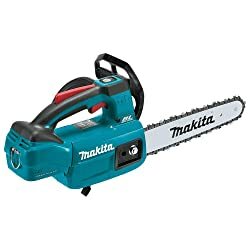 This chainsaw can last for half a day of continuous work. The noise level of the tool is not that loud where you can still hear your workmate yelling from the ground if you’re working on top of the tree. It can cut a downed citrus tree 5-6” limbs and a palmetto flawlessly. The overall construction is tough and beautiful. 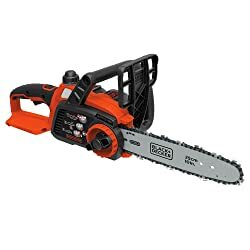 This chainsaw is simply surprising. It is much lighter but powerful and fast with its compact brushless motor. If you are using a 4Ah battery, the tool can last around 15 to 20 minutes. The body is well-balanced so you'll have no problem effectively maneuvering it single-handedly. Moreover, it requires less maintenance for you have no engine oil to replace and fuel to drain. 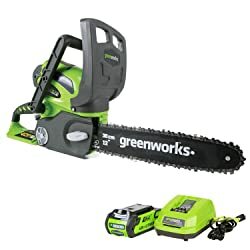 This chainsaw really easy to use and maneuver because it is lightweight and the body is well-balanced. The adjustment of the tension is easy and smooth. This is a great cutting tool for doing small to medium works. The manual lubrication seems to be annoying but necessary to maintain great performance. In comparison to Stihl, this one has more torque which means more cutting power. 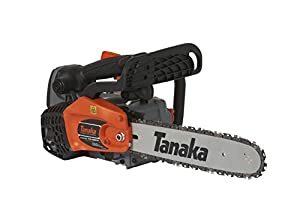 This chainsaw has enough strength to cut through a 30” diameter black oak wood. Using it is convenient for it is easy to start and maneuver, less vibration and kickback. Moreover, the safety features work really well. However, it is slightly heavy which might not be suitable for those with smaller hand or weaker arms. Its strength is comparable to gas-driven chainsaws. It is lightweight but tough body construction. It provides sufficient power and an aggressive chain. The auto-tension chain mechanism provides extra user comfort and quick operation. In contrast to gas types, this one is much quieter and cleaner. Else, it uses plenty of lubrication and portability is limited by the power cord but can be managed by using extension cords. This chainsaw tool has a well-balanced body and ergonomic handle which makes it easy to maneuver even for a 65-year-old operator. It is capable of cutting around 400 lbs of firewood or 75 cuts until the battery dies out. 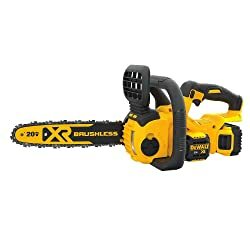 You can cut tree sizes from 2” to 12” for one and a half hour with this tool. It is fast charging, takes around 30 minutes to fully charge. The chain tensioning screw mechanism works definitely well. If it wobbles, it means the tensioner pin is not inside the hole. The 8Amp motor is ideal for light to medium cutting works. It has a soft and ergonomic grip handle. Some experienced constant loosening of the chain, that means the bar and the chain were not properly assembled. The design and build of this tool promote balance and ease of operation. It’s pretty much lightweight but durable to get the work done. The best thing about it is also the seven-year warranty of the model. A small trouble is: It lacks the bottom end torque which makes it hard to operate when the bottom part of the chainsaw rests on the wood. It produces comparable power with gas types but much quieter and cleaner. It cuts flawlessly using the full length of the bar and chain speed. The self-sharpening mechanism of the saw gives it added convenience. Capable of providing decent and sufficient cutting power for medium to heavy duty works. It has an enhanced filter system which ensures cleaner exhaust. The automatic oiler system works well in putting enough lubrication to ensure smooth cutting experience. It has an adjustable carburetor with deep guide holes for the spline tool and metal crankcase. Likewise, its vibration reduction system works well and ensures accurate cutting. Overall, design and built is tough and sleek. Overall, it consumes much lubrication but necessary.